Thank you, for posting your “Final Projection on the 2018 Midterm Elections,” Ronald! • Map: A combination of states carried by Hillary Clinton, the losing presidential nominee of 2016, and ones which were Republican pickups, in 2016, for Donald Trump. Add to that some emerging states (ones which will flip next time the presidency switches from the Republican to the Democratic column). There are precious ones which are Republican at the presidential level, as well, and are applicable from Kansas (the 2nd Congressional District of retiring Lynn Jenkins, which is open, and the 3rd of incumbent Kevin Yoder) and, perhaps, even Utah (the 4th Congressional District of incumbent Mia Love). 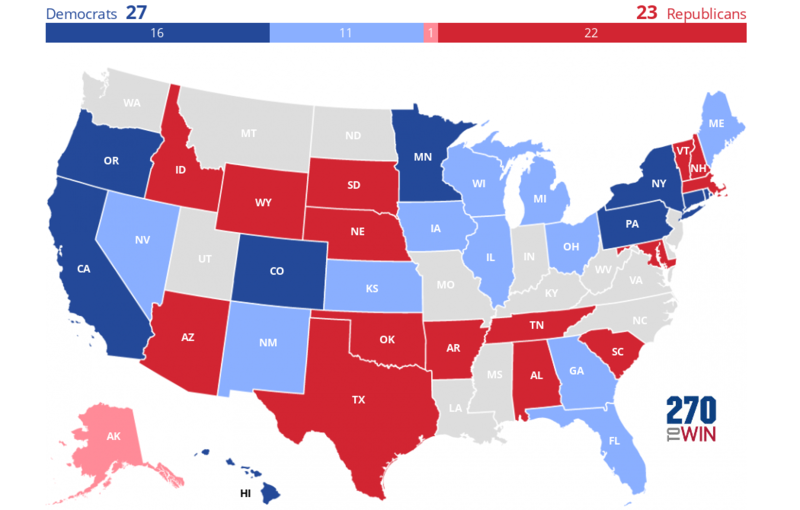 • Map: Democrats will flip both Nevada and Arizona, the lowest margins from the 2012 Republican column; Republicans will counter-flip North Dakota, the lowest margin from the 2012 Democratic column. A link to the map is provided. Solid shades are Republican or Democratic holds; those in light shades are pickups. • Map: I estimate the 2018 Democrats, with 16 governorships, will win a net gain of at least +9 to reach 25. Their likely order is as follows: 17) Illinois; 18) Michigan; 19) New Mexico; 20) Maine; 21) Iowa; 22) Florida; 23) Wisconsin; 24) Nevada; and 25) Ohio. But, since 1995, and following the 1994 midterm elections, the party which had majority in the U.S. House also had a majority count of the nation’s governorships. 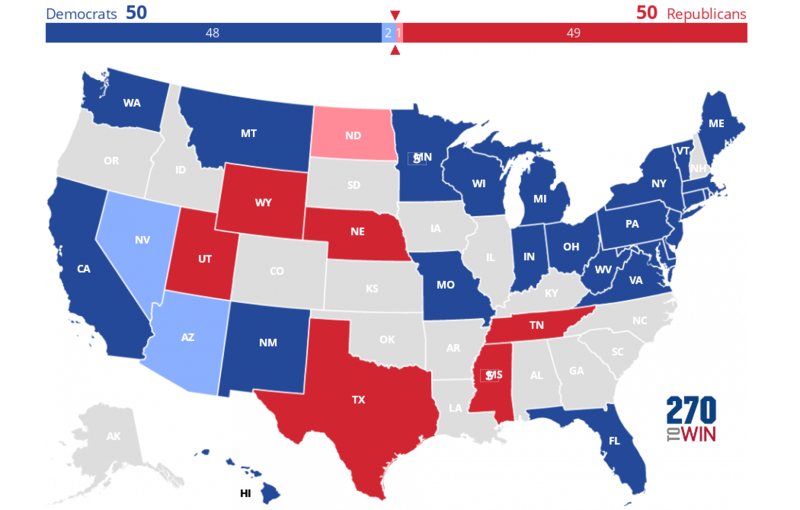 Rather than a tie of 25-to-25, I am predicting the 2018 Democrats will win over a new majority. If I turn out to be correct, the tipping point state will be, from my estimate, Kansas. It is flippable especially with the 2nd and 3rd districts in favor to become U.S. House pickups for the 2018 Democrats. There are also the 1st and the 4th district shifting conspicuously in that party’s direction. (Keep in mind: In 2014, Republican Sam Brownback won re-election by +3.69, the second lowest margin of gubernatorial party hold, just after Florida’s Rick Scott and his +1.07. And Kansas has elected White House opposition-party governors since 1990. This state is very flippable.) No. 27 is Georgia. And that is a state, a bit of a tricky one, that I may write about a little later. I see I am a bit more optimistic on the Senate, and the House, but not by much, and on the Governorships, we seem to agree!